Why is it that at every party the appetizers are usually the biggest hit? I make sure to have plenty of appetizers at every party I throw for everyone to try. 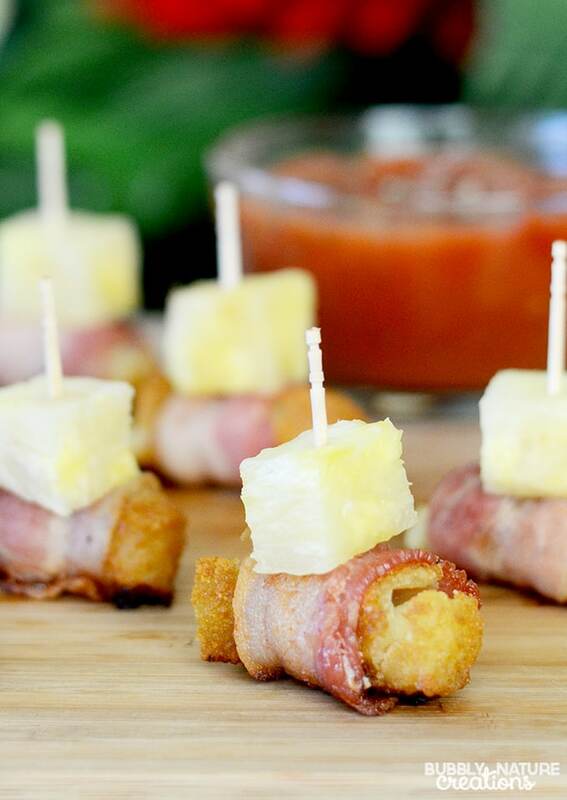 These Hawaiian Bacon Bites are delicious and simple to make. They remind me of a Hawaiian Style Pizza and go perfectly with a marinara dipping sauce. The ingredients are simple to remember… just bacon, Farm Rich breaded mozzarella sticks and fresh pineapple for the top. This is an example of a perfect recipe for the Farm Rich’s Back Your Snack Recipes & Voting contest! Be sure to look for the details below on how you can enter to win or participate by voting. Farm Rich snacks are easy to whip up for hungry kids (and adults). 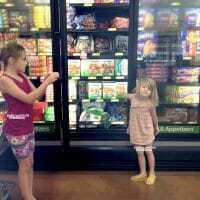 I make sure to pick up a couple of boxes for our family when we go to Walmart so that I will have them on hand. 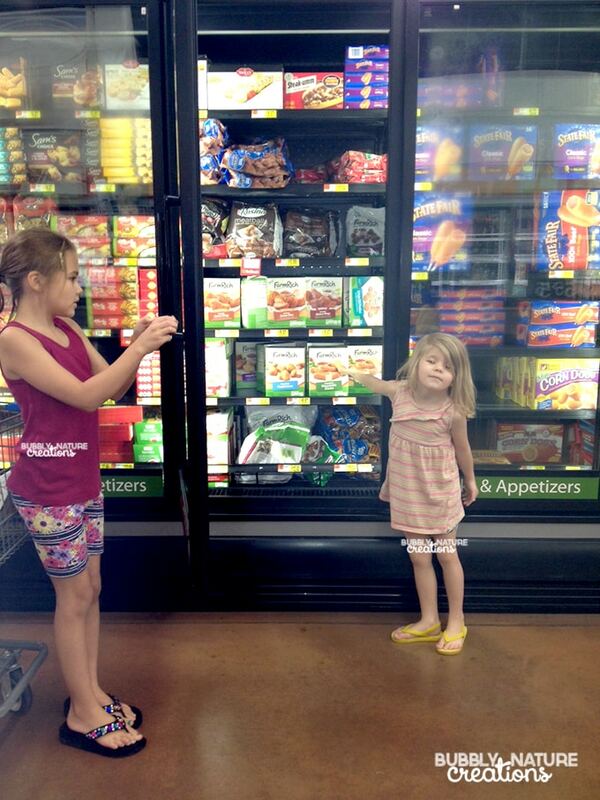 I always find them near the other frozen snack foods and near the pizzas. My youngest daughter especially loves the mozzarella sticks as you can see! The best thing about this recipe is how quick and easy it is to make! For such an easy treat… it always receives great reviews. Preheat oven to 400 degrees F. Cut the mozzarella sticks in half. If they are too hard to cut then thaw them just a little in the microwave (about 10 seconds). Wrap each half of the mozzarella sticks with one half of a strip of bacon. Repeat until all mozzarella sticks are wrapped with the bacon. Place the wrapped sticks on a baking sheet and bake for around 15 minutes. Do not let the bacon burn! The mozzarella may ooze out a bit so let them cool for 5 minutes after taking them out of the oven and use a spatula to scrape them up cleanly. To serve: Use toothpicks inserted into one piece of the pineapple then inserted into the bacon bites. Serve them with the toothpicks in, but be careful with little children eating these because of the toothpick. Serve with marinara sauce if desired. I will be making these yummy appetizers for a lot of parties from now on! Everyone says they taste just like a Hawaiian style pizza on a stick! What easy snack hack would you like to make with Farm Rich’s products? Be sure to enter into the Back Your Snack contest! See the full rule book, click here. The winner of the recipe contest will receive $10,000 and there will also be 5 winners in the voters “sweepstakes.” The Sweepstakes Prize is a prize pack containing all of the following items: a tote bag, a meat thermometer, grilling tongs, an oven sheet, an oven mitt, $50 worth of Farm Rich product coupons and a $50 Walmart Gift Card. The ARV of each Sweepstakes Prize is $140. Total ARV of all Sweepstakes Prizes is Seven Hundred Dollars ($700.00). 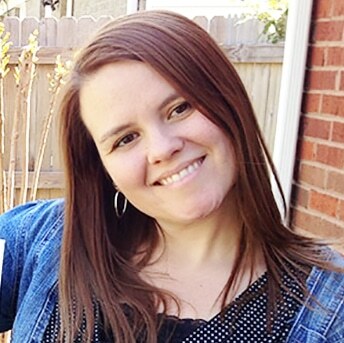 When voting in-store, you can opt in to a drawing for one of the Sweepstakes Prizes as well! Find the in-store demos here.